Navigator: 1530s, from Latin. navigationem (nom. navigatio), from navigatus, pp. of navigare "to sail, sail over, go by sea, steer a ship," from navis "ship" and the root of agere "to drive"
Among the earliest instruments to determine position and direction used by navigators was the compass. The magnetic compass was first invented as a device for divination as early as the Chinese Han Dynasty (circa 206 BC). The compass was used in Song Dynasty China by the military for navigational orienteering by 1040-1044, and was used for maritime navigation by 1111 to 1117. European open-sea navigation began during the 15th century in what is termed the Age of Discovery. Seeing at night, aboard a wooden vessel, also required a lamp and being able to view a compass without setting the ship aflame. The wild toss of seas could also interfere with checking a compass bearing and the course plotted to get from one side of the ocean to the other. It’s difficult to hold something level while the deck beneath you is angled to rise above a thirty metre wave – how to remedy these problems – a binnacle – the mount for the compass, usually located on the wheel's pedestal and which also housed the other navigational instruments needed. They were made so a compass was kept level and could also lock on a course chosen so the sailor at the wheel could keep to this course. Originally spelt binnicle, now spelt – binnacle, this is a Nautical Term for a housing for a ship's compass from C17: changed from C15 bitakle, from Portuguese bitácula, from Late Latin habitāculum dwelling-place, from Latin habitāre to inhabit; spelling influenced by bin - 1615–25; bin + (bitt)acle < Pg bitacola < Latin habitāculum lodge] Bin - A container or enclosed space for storage. From Old English binne basket, probably of Celtic origin; related to bindan to bind. There is also; The ship's Binnacle List is the medical department's report of personnel at sick bay, excused from that day's duty. A compass binnacle in front of the ship's wheel. The small stove-pipe chimney vents the lamp used to illuminate the compass face at night. We have, in the small samples of old reports pertaining to these wonderful collector’s items, left the original spelling as is – a good way to chart development in the invention and our language. New Yacht Binnacle. One of the handsomest and, at the same time, most useful trophies yet presented for a yacht competition for the yachts of the Royal Sydney Yacht Squadron, is that given this season by Vice Commodore Milson. It is a new yacht binnacle fitted with host double needle liquid compass, and nickel silvered. Numerous testimonials have been received, but the following explains very fully. From the FIELD, Mr. J. Beavor Webb, of the Freda yacht, says -I do not think I have mentioned our compass and binnacle. Every sailor knows the difficulty of getting one that will remain perfectly steady in a sea way, which difficulty is increased in the small craft, they jump about so much more than the large ones. I have tried many compasses by different makers, and, until last May, could not get one which would remain perfectly steady at all times. The construction of many early (mid-18th century) binnacles used iron nails, which were later discovered to cause magnetic deviations in compass readings. As the development of the compass and understanding of magnetism progressed, greater attention was given to binnacle construction to avoid compass disturbances caused by iron. With the introduction of iron-clad ships the magnetic deviation observed in compasses became more severe. Methods of compensation by arranging iron or magnetic objects near the binnacle were developed. In 1854, a new type of binnacle was patented by John Gray of Liverpool which directly incorporated adjustable correcting magnets on screws or rack and pinions. This was improved again when Lord Kelvin patented in the 1880s another system of compass and which incorporated two compensating magnets. These are colloquially known as "Kelvin's Balls" in the UK, and "Navigator's Balls" in the United States. William Thomson, 1st Baron Kelvin OM, GCVO, PC, PRS, PRSE (26 June 1824 – 17 December 1907), was an Irish and British mathematical physicist and engineer who was born in Belfast in 1824. Thomson was an enthusiastic yachtsman, his interest in all things relating to the sea perhaps arising from, or at any rate fostered by, his experiences on the Agamemnon and the Great Eastern. Thomson's wife had died on 17 June 1870 and, already addicted to seafaring, in September he purchased a 126 ton schooner, the Lalla Rookh and used it as a base for entertaining friends and scientific colleagues. His maritime interests continued in 1871 when he was appointed to the board of enquiry into the sinking of the HMS Captain. Thomson introduced a method of deep-sea sounding, in which a steel piano wire replaces the ordinary hand line. The wire glides so easily to the bottom that "flying soundings" can be taken while the ship is going at full speed. A pressure gauge to register the depth of the sinker was added by Thomson. About the same time he revived the Sumner method of finding a ship's place at sea, and calculated a set of tables for its ready application. He also developed a tide predicting machine. 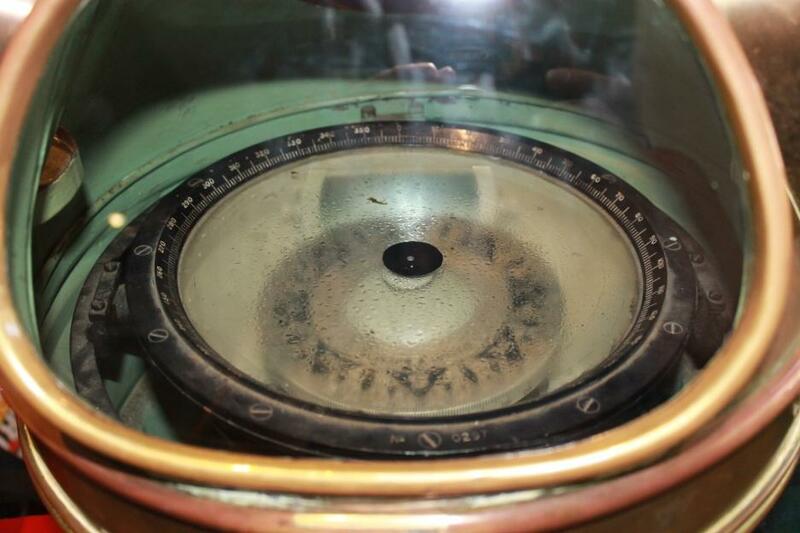 During the 1880s, Thomson worked to perfect the adjustable compass in order to correct errors arising from magnetic deviation owing to the increasing use of iron in naval architecture. Thomson's design was a great improvement on the older instruments, being steadier and less hampered by friction, the deviation due to the ship's own magnetism being corrected by movable masses of iron at the binnacle. The other point of note regarding this gentleman is the promotion of using the Morse Code as a means of communication at sea - Charles Babbage had been among the first to suggest that a lighthouse might be made to signal a distinctive number by occultations of its light but Thomson pointed out the merits of the Morse code for the purpose, and urged that the signals should consist of short and long flashes of the light to represent the dots and dashes. James Sinclair, 14th Earl of Caithness FRS (16 August 1821 – 28 March 1881), styled Lord Berriedale from 1823 to 1855, was a Scottish Liberal politician, scientist and inventor. He was a Vice-Admiral of Caithness, tutor to Edward, Prince of Wales, (the future Edward VII) and was a Lord in Waiting to Queen Victoria - 1856-58, and 1859–66. Queen Victoria created him the 1st Baron Barrogill, in 1866, taking the Barony’s name from the Castle of Mey which was then known as Barrogill Castle. This is a peerage of the United Kingdom which can only pass down the direct male line, and became extinct on the death of his son, George Sinclair, 15th Earl of Caithness. He sat as a Representative peer for Scotland in the House of Lords from 1858-66. He was elected a Scottish Representative Peer in 1858, and served in the Liberal administrations ofLord Palmerston and Lord Russell as a Lord-in-Waiting (government whip in the House of Lords) between 1859 and 1866. He was also a respected scientist and inventor and was a Fellow of the Royal Society. The short biography attached to his pencil portrait explains that he was an inventor of a steam carriage, (actually the modifier for safety reasons), the gravitating compass and a tape-loom. He was a great industrial improver, with great enthusiasm for modern machinery. He introduced “steam” to Caithness by improving and making previous designs safer. First came his “steam car” in 1860, followed by the steam plough which he used to create his new farm at Philip Mains, Mey. He also invented an automatic rail-carriage-washer for the American market. One of his most unexpected inventions was an artificial leg, with which he won a prize at the French Exhibition in Paris in 1866. In 1877, he published “Lectures on Popular and Scientific Subjects”. 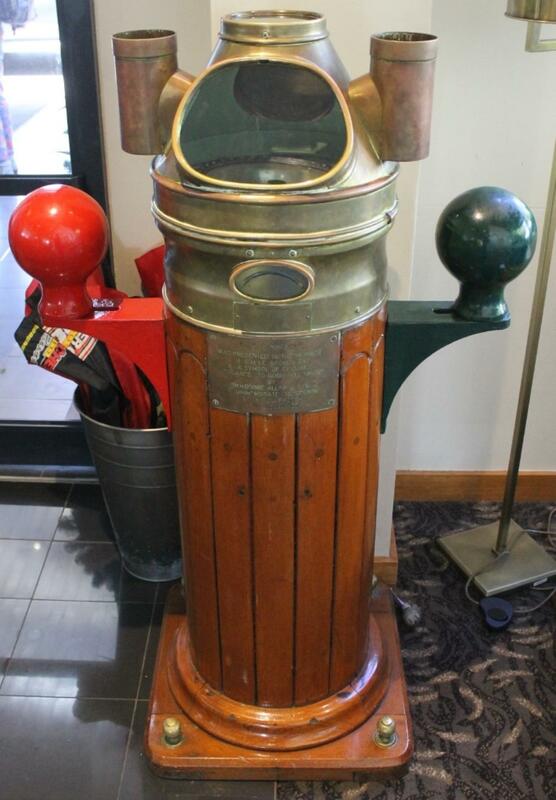 The binnacle shown here in the coloured photographs stands in the foyer of the Royal Motor Yacht Club – Broken Bay, at Newport. It was gifted to the club by Commodore Allan G Leslie (Life Member 1970) under whose leadership of four years many successful projects of upgrading the RMYC at Newport were undertaken, including reclaiming the foreshore, remodelling the swimming pool and building a 300 space carpark. The building of a new clubhouse started in April 1966 and was built around the old clubhouse, thus preserving the past with its fond memories. The official opening took place on 17th August 1968 and was performed by Lady Cutler, the wife of Patron and NSW State Governor, Sir Roden Cutler. 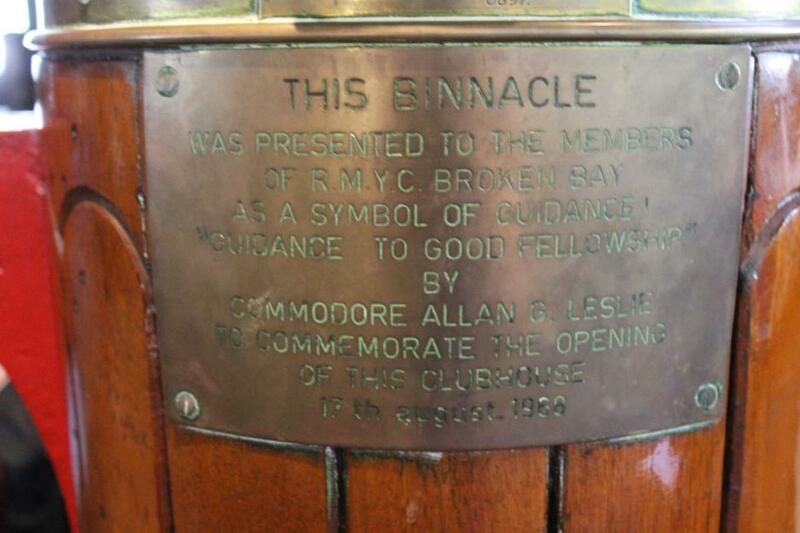 This binnacle was placed to commemorate that opening of the new clubhouse. On Saturday 29th March, 2014 - the Blue Water Navigational Trial will take place through the Royal Motor Yacht Club - Broken Bay as part of the 2014 Pittwater Festival. This is for the keen power boat enthusiast and a navigational time trial that will see competitors negotiate a predetermined course testing their accuracy in navigation. Electronic Navigational aids can be used, which is an ideal opportunity to use all that gadgetry on board! Researched/photographed by A J Guesdon. Copyright Pittwater Online News, 2013. All Rights Reserved.